On February 28 and March 1 the RAF Learning Lab team – in collaboration with Dalberg – hosted a webinar summarizing insights from our second Learning Brief, Better together: Last mile partnerships for smallholder finance. The webinar reviewed key insights around partner motivations, challenges to partnership formation, and supporting factors for business partnerships between agribusinesses (value chain actors) or ag-focused technology providers and financial institutions. See below for the full webinar recording, webinar presentation, baseline report, and a link to the Learning Brief. 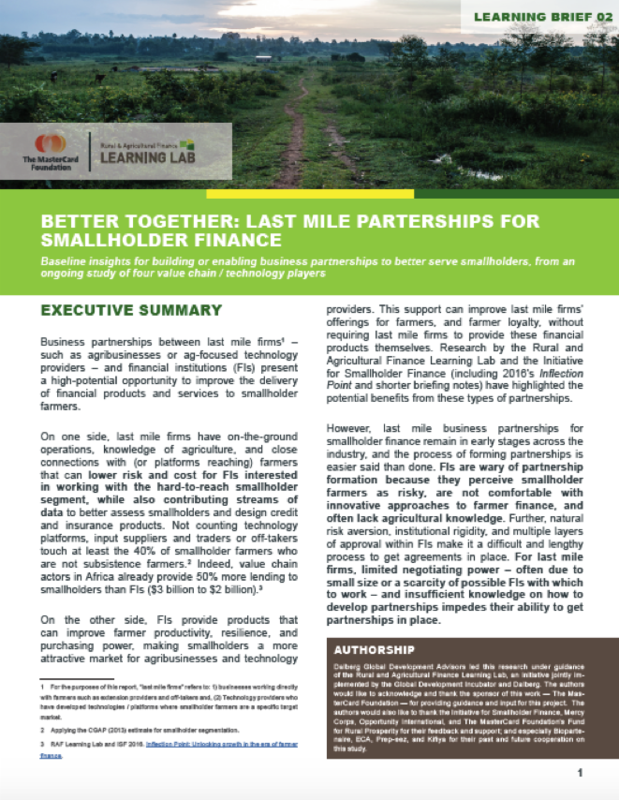 The second in the Lab's Learning Brief series, "Better together: Last mile business partnerships for smallholder finance," offers baseline insights for building or enabling businesses partnerships to better serve smallholders. These are early findings from an ongoing study of four value chain/technology players looking to partner with financial institutions. Read the full learning brief here.